Associate Professor Jaydev Desai (mechanical engineering) has been selected to attend the next National Academy of Engineering Frontiers in Engineering Symposium. The participants -- engineers ages 30 to 45 who are performing exceptional engineering research and technical work in industry, academia, and government -- were nominated by fellow engineers or organizations and chosen from approximately 315 applicants. Before joining the Clark School in 2006, Desai was the director of the "Program for Robotics, Intelligent Sensing, and Mechatronics (PRISM) Laboratory" at Drexel University. Desai completed his undergraduate studies at the Indian Institute of Technology, Mumbai, India, in 1993. He received his M.A. in mathematics in 1997 and M.S. and Ph.D. in mechanical engineering and applied mechanics in 1995 and 1998 respectively, all from the University of Pennsylvania. He was also a post-doctoral fellow in the Division of Engineering and Applied Sciences at Harvard University from 1998 to 1999. 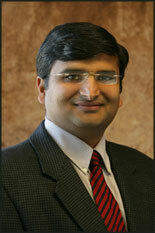 Desai holds an NSF CAREER Award for research in “Minimally Invasive Surgery Using Haptics and Vision”. His research within the area of medical robotics is specifically targeted towards: haptic interfaces for robot-assisted surgery, reality-based soft-tissue modeling for surgical simulation, model-based teleoperation in robot-assisted surgery, and force feedback interface for cellular surgery. In the past, he has also worked on graph theoretic framework for modeling and control of modular robotic systems. The symposium will be held in September at Google headquarters in Mountain View, Calif., and will examine additive manufacturing, engineering sustainable buildings, neuroprosthetics, and semantic processing.